Ball Horticultural Company (Booth #5043) captured the coveted Ted Van Veen Best in Show booth award at the 2018 Farwest Show. The company won for its vividly colored booth packed with flowers and brightly lit displays, including a display of energy-saving LED grow lights. The show also recognized exhibitors who put extra creativity into their booths with three Far From Ordinary booth awards. Winning that award this year were Youngblood Nursery (booth #18047), Bamboo Garden (booth #18014) and Open Range (Booth #10058). The Farwest Show serves professionals engaged in the nursery industry and related trades, including retail nurseries, wholesale growers, landscapers, landscape designers, and others involved in the green industry. For more information about the 2018 Farwest Show, visit www.farwestshow.com. 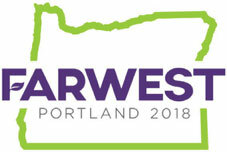 Farwest is produced by the Oregon Association of Nurseries (OAN), a trade organization that represents and serves the interests of the ornamental horticulture industry. The OAN, based in Wilsonville, represents more than 750 wholesale growers, retailers, landscapers and suppliers. Any revenue realized from the Farwest Show is reinvested into the industry through education, research, marketing support and government relations. Oregon’s nursery and greenhouse industry is among the state’s largest agricultural commodities, with annual sales of $948 million in 2017. It is also a traded sector; close to 80 percent of the nursery plants grown in Oregon are shipped out of state. For information, visit www.oan.org or call 503-682-5089.